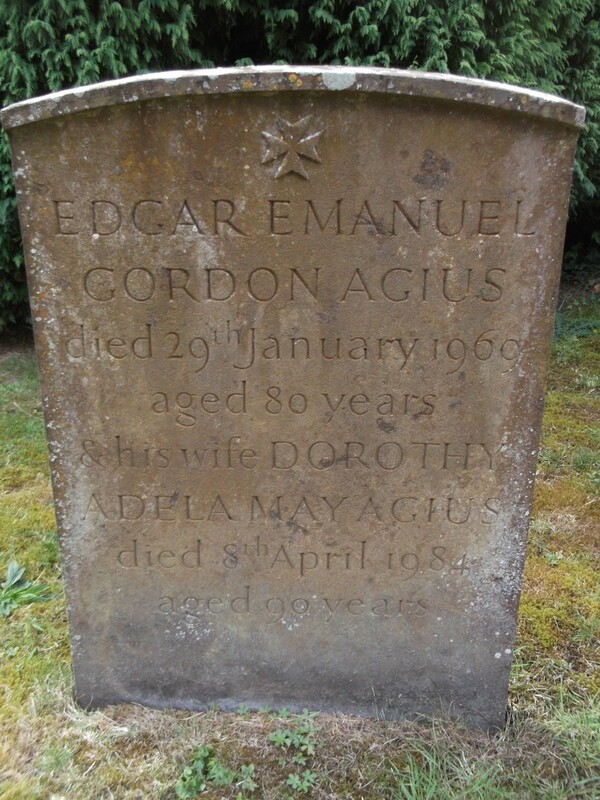 Edgar was born 1st December 1888 at the family home in Belsize Park Gardens,Hampstead – the twelfth of fifteen children to Edward Tancred and Maria Concetta Agius (nee Muscat). 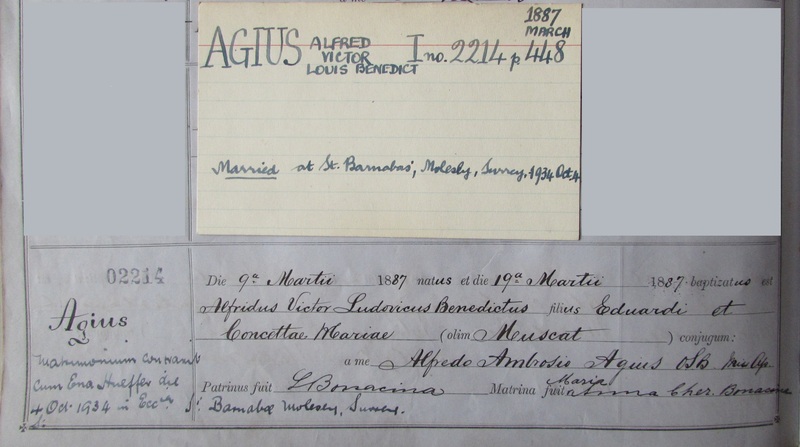 He was baptised at St Dominic’s Priory by his uncle, Dom Ambrose Agius OSB , a Benedictine monk who later became Apostolic Delegate and Archbishop in Manila. In 1900, Edgar started at Downside School at the same time as older brother Alfred and younger brother Tancred. Edgar left Downside in July 1906 and had a year working in the family business before matriculating at Trinity College, Cambridge in October 1907 (aged 18). He gained his BA in 1910 and went back to work in the family business in the Glasgow office. On 12 November 1914 Edgar joined the Inns of Court Officer Training Corps (ref ‘The Inns of Court OTC in the Great War’). By then his brothers Alfred and Arthur , who had been in the 3rd London Regiment Territorials before the war, were in Malta with the 1/3rd Battalion , while younger brother Richard had joined the 2/3rd Battalion in September and was then training at a camp in Suffolk. Joining the Inns of Court OTC may just have been a path to get him into the London Regiment because just 2 months later , on 24th January 1915, he was commissioned as a 2nd Lieutenant in the 3/3rd London Battalion , the newly formed battalion to replace the 2/3rds now in Malta (while the 1/3rds had moved to the Western Front). 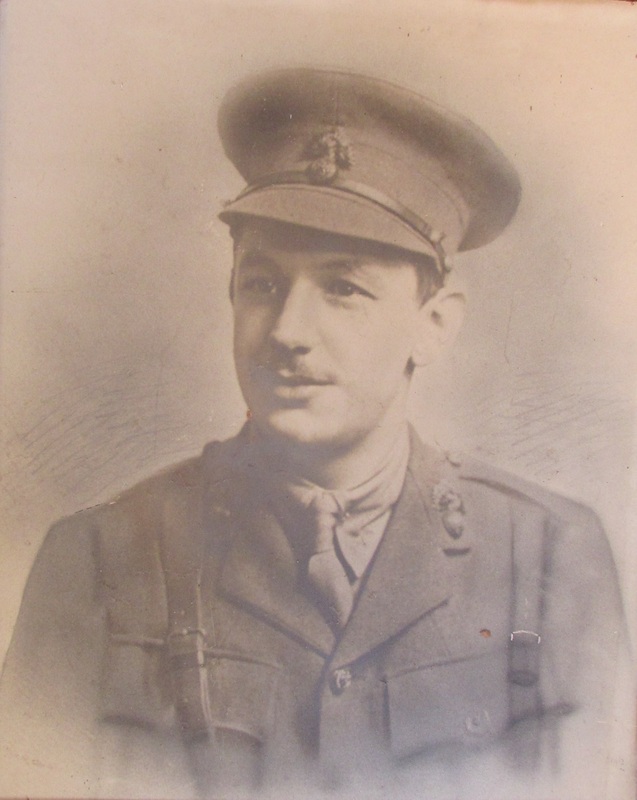 Following the great losses suffered by the 1/3rd Londons at Neuve-Chapelle in March 1915 , Edgar was re-assigned to the 1/3rds and was happily re-united with his brothers Alfred and Arthur when they returned from Easter leave on 7th April. For the next 6 weeks the 3 brothers were stationed together, and Arthur’s letters tell of a number of occasions when they were able to meet for dinner. Alfred, Edgar and Arthur all saw action in the attack on Aubers Ridge (9th May 1915) and the Battle of Festubert (15th-25th). Edgar was wounded during the attack of 16th May and invalided back to England. Shortly after that he wrote a letter to his brother Richard in the 2/3rd Londons describing the events of 16th May. 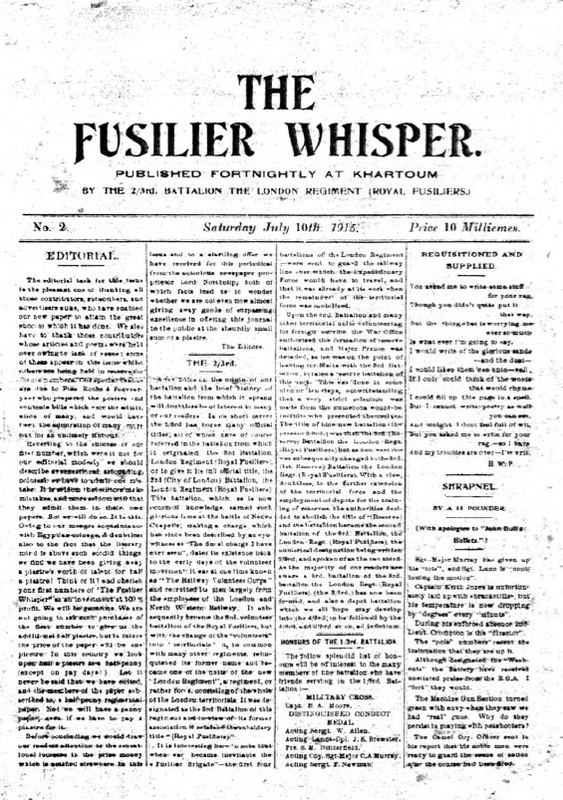 At that time Richard was stationed in Khartoum where the battalion published two issues of a newspaper called ‘The Fusilier Whisper’. Edgar’s letter to Richard was published in the 2nd issue of 10th July 1915. “We had had a pretty severe time. We had a long spell in the trenches (9 days), and then a week a little way back in billets, where we were supposed to be resting, but we were under 15 minutes notice to be called out (as a matter of fact we were called out once at 4.30 a.m. to repel an impending attack, which was not delivered however). We were well within shelling area and so had no real rest. When we went into action on May 9th we started by being the reserve Battn. of the reserve Brigade of the assaulting division (the Meerut Division). So we started entrenched about a mile behind the front line. We were in position about at 2.30 a.m. and the bombardment commenced at 5 a.m. Hell of a row. Two 15 pdr batteries were about 80 yards directly behind us, and several more about 100 yards in front. All told there were 600 guns blazing rapid fire for 40 mins. We waited till 11 a.m. for orders and then moved up by platoons. We started getting ? desultory shell fire half an hour later as I waited under cover of a trench for further orders. The wounded began streaming by, and we saw one of our batteries put out of action by Hun shells, a wonderful sight. We then got orders to move up closer and came under pretty heavy shrapnel. We moved up a long trench in file. The trench was full of wounded trying to get back, and was being smashed up by shells. We then moved in to the support trenches. The assaulting brigade had failed in the attack and lost heavily, and was being relieved by the supporting brigade, and we were to support the next attempt. We were under very heavy shell fire for a couple of hours and lost a good many men. I had a bite of lunch (bread and cheese). At 4 p.m. the second bombardment commenced; it lasted 40 minutes. The attack was launched but failed again, and we were pushed up to relieve the remainder of the brigade. It was getting dark, and so were not pushed into the assault, which was postponed. 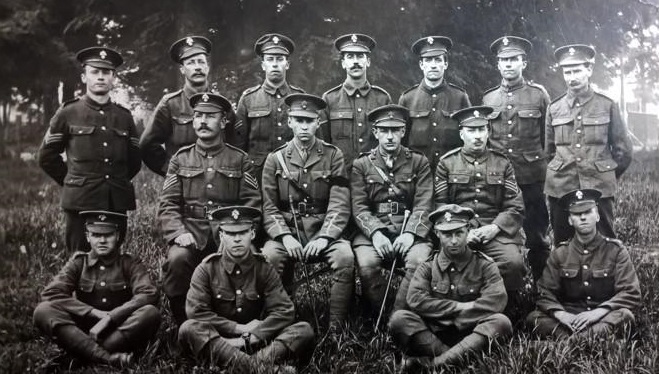 After convalescence Edgar was posted to the 4/3rd Londons Reserve Battalion and by May 1916 was a Company Commander at Hurdcott Camp Wiltshire , where they were training new officers for the front line battalions. Later that year Alfred, Edgar and Richard were together in the now named 3rd reserve battalion before Alfred returned to the front line October 1916 to April 1917 (wounded). Edgar was posted back to the 2/3rds in March 1917, followed in May by Richard (who had been in the 2/3rds at the start of the war). They were now under the command of Col Beresford who had been with Alfred and Arthur at Neuve-Chapelle in the 1/3rds. On June 13th, Fr Ambrose then with 21st Division discovered the brothers were near by and rode over to meet them, where they had a happy evening together prior to a significant action by the 2/3rds on 16th June north of Bullecourt attacking the Hindenburg line. Edgar was with Richard for the next few months as the 2/3rds were moved up to the Ypres Salient in August 1917. We are unsure of his position on the fateful day that Richard was killed at Poelcapelle on 26th October 1917. After the war he helped Arthur to pin-point the spot where Richard fell but was never recovered. (See location map on Richard’s page). Edgar remained on the western front until February 1918, overlapping with Alfred for a short time when he (Alfred) was posted back to the amalgated 3rd London Regiment in January 1918. Edgar then transferred to the 1/6th Sussex Regiment and went with them to a camp in Ennis, County Clare, Ireland, for a few months. The London Gazette records that on 10th July 1918 Edgar was seconded to be acting Captain while Assistant Reception Camp Commandant and adjutant. At first this was at the 38th Division reception camp behind the front line as the Allies made the final 100 day offensive. When Douai was recaptured Edgar moved to the 49th Division reception camp set up in the barracks in Douai and was there when the Armistice was declared. 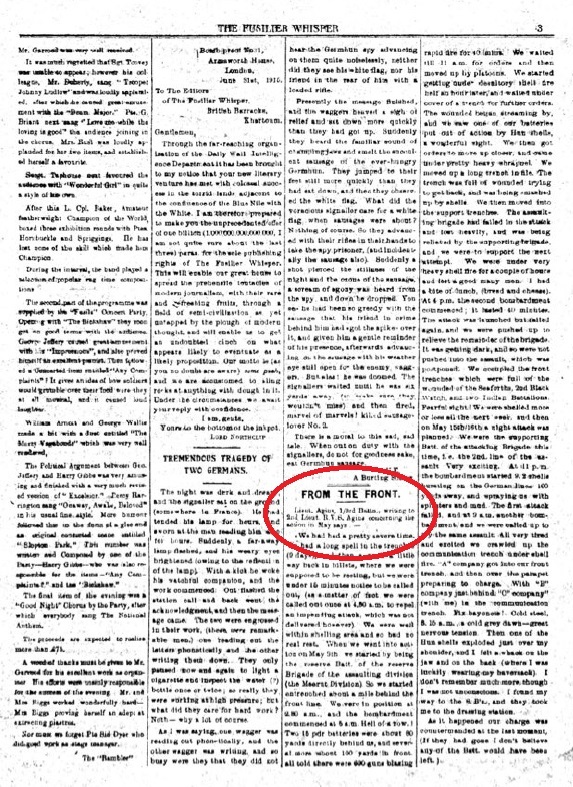 Edgar left the army on 15th February 1919. Edgar married (Dorothy) Adela Hatton-Hall on 24th April 1921 and had one son, Peter, who followed in his footsteps by going to the newly founded Worth Preparatory School in 1934 and then Downside School . The family lived in France, at first in Lyon then Paris, for Edgar’s work with Esso. As the German Army moved on Paris in June 1940, Edgar was unable to escape and found himself in the St Denis internment camp where he remained for the duration of WW2. After the war Edgar and Adela returned to London , living at 41 Lexham Gardens for the rest of Edgar’s life. He died in January 1969 , first of the 4 brothers who survived the war. He is buried in the graveyard of St Leonard’s Sunningwell.